CNN editor Sharif Durhams wants the NLGJA organization — and journalism as a whole — to better reflect the American audience. The national association that represents LGBTQ journalists, an organization that's struggled to foster diversity, has elected its first president of color. 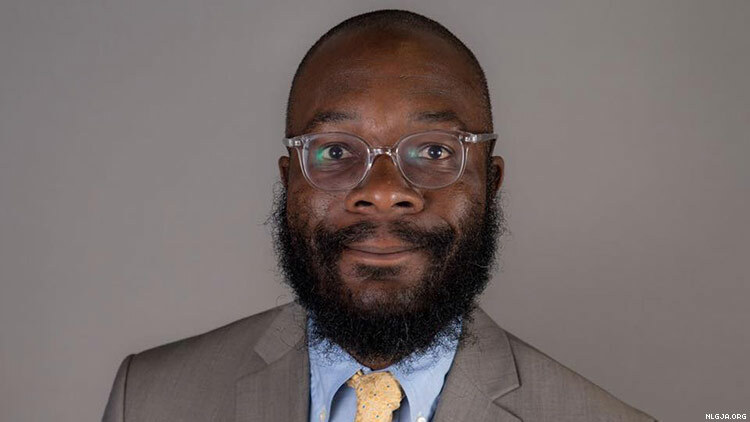 Sharif Durhams, a senior editor for news and alerting for CNN Digital, will serve a two-year term as the ninth president of NLGJA: The Association of LGBTQ Journalists. Durhams, an African-American gay man, began his tenure on Sunday following the conclusion of the group's occasionally contentious national convention in Palm Springs, Calif.
NLGJA's outgoing vice president for broadcast, Durhams has spent 10 years as part of the group's leadership, serving on the board of directors and as president of the Carolinas chapter. He is determined to ensure that the association reflects the diversity of the LGBTQ community nationwide. The organization's outgoing president, CNN producer Jen Christensen, is confident Durhams will continue her work to broaden NLGJA's membership. Christensen said “it’s about darn time” NLJGA has a president of color. She expects Durhams’s connections, journalistic skills, and experience with the association to create opportunities for the organization, which is operating at a time when the president regularly attacks the media, often calling it "the enemy of the people." Before working at CNN's website, Durhams served as a home page editor of The Washington Post. He first attended an NLGJA national convention in 2000 and found a support system that showed him journalists could be out, proud, and successful. Durhams’s ideas have contributed to a variety of views since then, said NLGJA treasurer Ken Miguel, who has worked in leadership with Durhams since the early 2000s. Of NLGJA’s 850 members, 85 percent filled out some or all demographic information on their profiles. Of those, 59 percent identified as men and almost a quarter identified as women. Almost 5 percent identified as nonbinary or transgender. Another 1.4 percent identified as genderqueer, genderfluid, gender-nonconforming, agender, or two-spirit. Some members identified themselves belonging to multiple categories, and 11.8 percent did not specify. Regarding ethnicity, 60 percent identified as white, and 23 percent identified as nonwhite, including African-American, Latinx, Asian-American or Pacific Islander, Native American, Caribbean, and Middle Eastern. Three percent identified as multiracial, some chose multiple categories, and 17 percent did not specify. The tone Christensen has set on diversity, partly by seeking speakers with a variety of identities, has helped the organization, Durhams said. He plans to build on efforts to bring more voices to NLGJA, as well as encourage the media to hire more queer writers, reporters, editors, and producers. “We're in a position in which we can be an industry leader and industry voice,” Durhams said. Improving outreach to small and local newsrooms is another of Durhams’s goals. NLGJA can serve as a resource on how to better cover bisexual and transgender people of color, he said, especially as the industry has cut back on training in light of budget cuts and staff reductions. By focusing on training opportunities to help journalists move up, Durhams wants to help different voices get to the meetings where executives make decisions. He also plans to both help and hold accountable newsrooms by collecting data about where and in what positions LGBTQ journalists work. Not all newsrooms track LGBTQ identities in their diversity studies. This story was produced as part of CONNECT, NLGJA’s training program for student journalists.